Since Lundulph keeps asking for roasted animals, I thought I'd make something more special. Well, there was also a special offer in Sainsbury's. So I got two poussins, ready for roasting. Turn on the oven at 190 degrees C/gas mark 3. Peel and chop the onion coarsely. Peel and crush the garlic, what I did was just squash it with the side of the kitchen knife. Stuff each poussin with an onion, garlic, thyme and sage. For each bird, pour a small amout of oil into your hand, then rub in the bird all over. I left the skin on, even if it had some hairs and feathers still left on it. Place on a roasting grill and place in the oven to cook for 50 minutes. When I got the birds out, the skin was very crispy and the feathers and hairs seemed to have disappeared. Also they were very juicy, so careful when carving. But then I covered them with aluminium foil, while the rest of the dinner was getting ready and this was a mistake - the skins went soggy, so the birds shouldn't be left to stand after they are done. Well, unless there is a trick to make the skin remain crispy. I don't like the skin, so I don't mind, but I think Lundulph was a bit disappointed. Also the onions weren't cooked, but were rather crunchy, I guess this is due to the short baking time of he poussins. 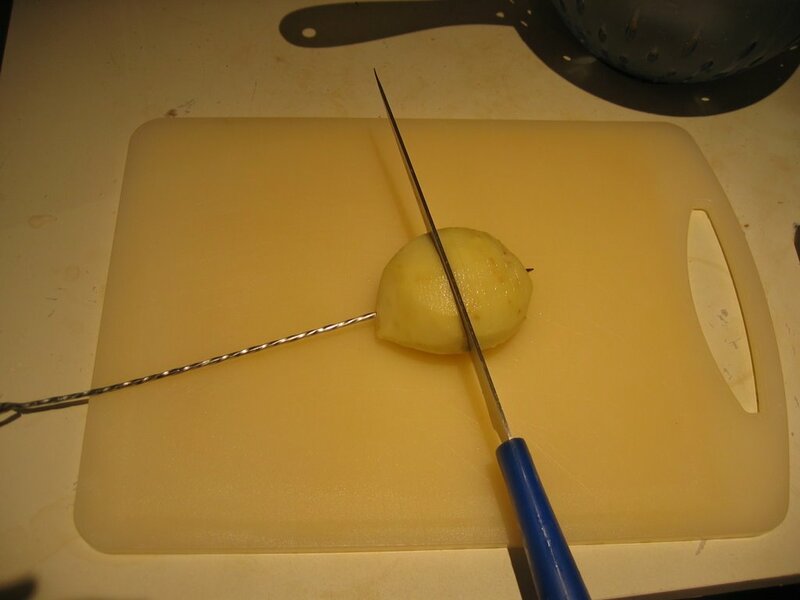 Wash the potatoes well, peel if the skin is thick, then cut into wedges, where the thickest part is no more than 1 cm wide. Place in a pot and boil for about 7-10 minutes. In the mean time, pour the oil in a bowl and add the spices, press in the garlic and let infuse until the potatoes are ready. When the potatoes have cooked for 7-10 minutes, drain well, then turn over onto a deepish baking tray. Distribute the infused oil, then stir the wedges around so all get well coated with the oil. Bake until ready, about 40 minutes, e. g. together with the poussins, in which case place then under the birds. In addition to that, I did Yorkshire puddings (Delia Smith's recipe from her Complete Cookery Course book), steamed some broccoli and made Bisto chicken gravy - 6 heaped tsp to 280 ml. 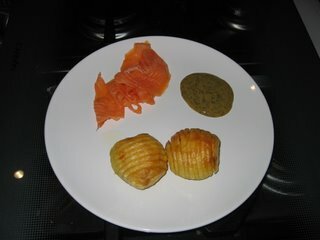 Note: I used a mix of potatoes, since I had some left over from earlier: King Edward, Vivaldi and Anya. Both King Edward and Vivaldi were great, but the Anya were a bit too hard, so don't use for baking/roasting. I haven't tried this very English dish yet, I've seen it made on telly and have had certain doubts about it, but some time ago I saw a variant with an Italian twist - use panettone instead of bread - and that just clicked. So today I have made Panettone Bread and Butter pudding. As usual, I have made small changes. The main one is that the panettone I managed to find at the end of September (not easy, believe me!) was absolutely enormous. So I increased the amount of custard with about two thirds. I should have doubled it really, but I think I can just about get away with this amount. Next I got Jersey gold top milk which has 5.2% fat as opposed to regular full milk, which I think is around 3.5%. Also, buttering panettone is pretty impossible, so I'm sure I used way too much - about 180 g I think, so we'll need to eat a little at a time. Finally, I didn't have grappa for soaking the sultanas, so instead I used Bulgarian rakia, which is pretty much the same thing - a type of brandy. But it has quite a sharp taste, so maybe grappa is better. Unfortunately, the recipe doesn't say how long to cook it if it's being done in a large dish, which I did, since I don't have little ramekins yet. Memo to self, put little ramekins on kitchen shopping list. So I baked the pudding for about 25 minutes. Also I'd forgotten to get cream for it, but that was just as well, as it was very rich to say the least. Definitely reduce the amount of butter next time. And probably just do half a panettone. 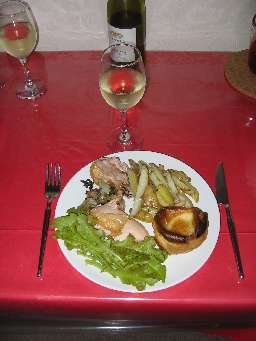 Otherwise, it was very tasty and some strength of character was needed not to take seconds. Now since I have so much of it, I'll try to freeze some, to see how it'll cope with that. Going through my paper recipes in preparation for our Christmas Dinner, I notice that I haven't included the recipe, so here goes. Pre-heat the oven to 220 °C and place a deep pan half-filled with water in it. Cut the panettone into 2 cm thick slices. Mix together milk and cream in a saucepan. Cut the vanilla pod in half, scrape off the seeds and add to the mixture along with the pods halves, then bring slowly to the boil. Whisk eggs and sugar to a fluffy pale foam. Using a cheese slicer, cut thin strips of butter and place on the panettone slices. Then cut the slices into cubes. When the milk has boiled, remove the pod halves from the mixture. Slowly pour the hot mixture into the egg/sugar mixture, while whisking constantly. 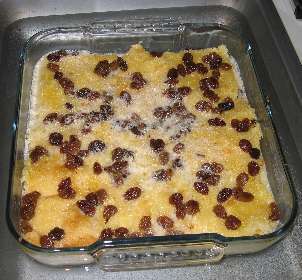 Place the panettone cubes in an oven-proof dish or in small ramekins. Pour the egg mixture over and sprinkle sultanas on top. Carefully place in the water bath in the oven and bake until golden brown on top and the custard has cooked. I was introduced to smoothies when I was in the US in 97. I visited a friend in Monterey in California and there was a smoothie bar there. I haven't seen anything like it in Europe, but I think it was a brilliant idea. A few years later, I started making my own. 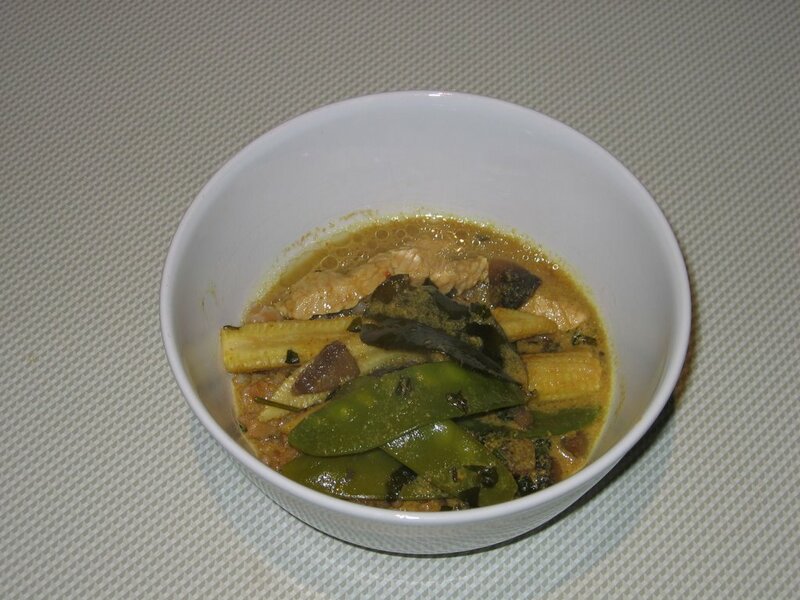 Here is my regular recipe. Peel and break up the bananas in bits. Cut up the mango on both sides of the large stone, then with the knife point cut squares into each of the side pieces and wring them out, so that it looks like a hedgehog. Then cut the bits off as close to the skin as possible. Finally trim off as much fruit flesh off the stone as you can. This is a messy job and the method of cutting is sometimes illustrated on the sticker label of the mango itself. It works well for me. Wash the strawberries, then remove the green bits. 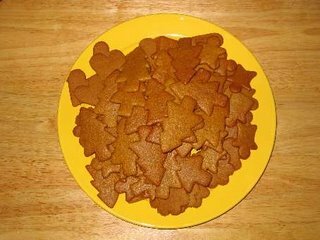 Cut large ones in smaller pieces. Now I have a smoothie maker, which is a blender with a tap. 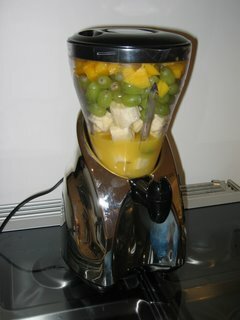 So I put all the fruit in there, add the juice and blend untill it goes nice and smooth. But it works just as well to put everything in a jug and use a hand blender. Enjoy. This should be enough for 4 x 330 ml glasses. It can be kept in the fridge for 3-4 days, but may separate and change colour. After that it starts fermenting. I have tried substituting the strawberries for blackberries, this is quite nice too. When there are no strawberries around, I add an extra banana. Also, I bought a bottle of rose petal syrup from an arabic shop. This is also excellent to put in, say 2-3 tbsp, gives nice pink colour and a nice fragrance to it. Though mangoes tend to overpower the flavour of the rose petals. It's also add sweetness since it has a lot of sugar in it. 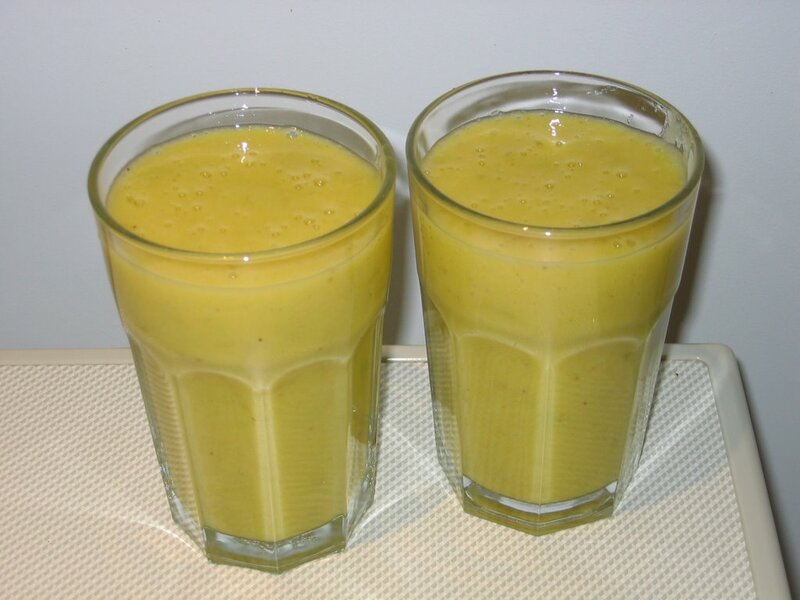 The juice can be substitued for milk or yogurt. Hot tips from Instant Karma are the Sainsbury's Be Good To Yourself fruit yogurt with semi-skimmed milk. And also the use of Guest Fruits like grapes, kiwi and blueberries. 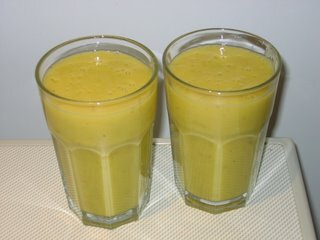 He has also issued a warning not to use apples as they make the smoothie texture gritty, like it has sand in it. Top tip! Here's my trial with grapes instead of strawberries. Verdict - tasty, but the skins of the grapes were not smoothed, so drinking was a bit of a challenge. That could be because I tend to over-fill the blender. When I was at uni, occasionally I'd cook noodles. The cheapest available were the dried ones, pre-packed with a small sachet of spices and another one with some orange coloured fatty stuff. The noodles required you to pour boiling water on them and leave for 3 minutes and stir in the spices and fat. It's really good and warming, but oh so boring and although I didn't try this myself, I do know at least one person who has survived on these a lot longer than anyone thought possible. There is a better way to do these. Get some nice pork fillet and slice in thin strips and place in a bowl. Pour some light and dark soy sauce and leave to marinate for about 10 minutes. In the mean time cut some vegetables into thin strips - carrots, peppers, onion, mushrooms. Make the noodles as per the instructions on the packet, but use more water - up to double the amount. In a deep non-stick pan, heat up some grape seed oil and stir fry the meat and vegetables. No need to drain the marinade, put it in as well. Don't fry until everything is ready, just to get it browned. Then add the noodle soup, bring to the boil and let boil for 5-10 minutes. Whisk an egg, then pour it slowly into the soup, while stirring all the time. Mix apples, sugar, hazel nuts and cinnamon. Mix sugar, flour, semolina and baking powder. Grease a cake tin with butter. If you have one with a removable bottom plate, the better it is. Place a third of the apples in the cake tin, then cover with a third of the flour mix. Continue with the next third of apples and flour mix, and then another layer with the final thirds of apples and flour mix. Cut thin slices of butter and place on top of the last layer of flour mix. In fact, if you have a cheese slicer, this is perfect to get thin slices. Bake in the oven at 200 degrees C or gas mark 6 for about 30 minutes, until the cake surace turns golden brown. Leave to cool a bit before taking the cake out of the tin, by turning it upside-down. Serve with custard or whipped cream. The story behind this cake is that when I was a toddler, I'd watched my Mum baking in the kitchen and I'd seen her mix ingredients in a bowl into a dough, that she'd pour out of the bowl onto the work surface, then knead into something. So one day, she'd done this mix and I'd sneaked in, determined to help her. The result of pouring the mix onto the work surface was a kitchen filled with flour dust. I have no memory of this, but I do remember that she'd never let me help her out later on. Also I've been having a discussion with Lundulph about cooking apples. This is a new concept to me. There are only dessert apples in Sweden, Germany and Bulgaria. In order to settle things, we've decided to make two lots of some sort of apple cake, one with dessert apples, one with cooking apples and see how they taste. Granny Smith apples are defined as both dessert and cooking apples, I think, so it's a way of getting around this. As this is a Bulgarian recipe, I suspect a different variety of apples would be used. So I can only suggest that you experiment. I picked this up when I was in Munich some 10 years ago, however, I've changed the recipe to be something like a potato soup. Wash, peel and dice the potatoes, then steam them. In the mean time, peel and dice the onion coarsely. Peel and slice the mushrooms thinly. Place along with the onion in a deep bowl. Add the soy sauces and balsamic vinegar and let them stand for a few minutes in the marinade. When the potatoes are ready, transfer them to the bowl as well, pour over the vegetable stock and stir well. The original recipe didn't have mushrooms in it and no marinade was made. Also I think 3 tbsp vegetable stock was used for the potato salad. I think at some points, I'd put 2-3 dl stock and I'd get a soup that's a bit on the sour vinegary side, which I quite like. Lundulph doesn't like cheese, in fact he strongly disapproves of the whole concept. He says it's milk that's gone off. Actually that would be yogurt. Cheese would be a step beyond that. I like pizza, I really do. So how combine the two? Besides tasting nice, if you put the chese on top of the pizza, it acts as a lid, getting everything else cooked and moist underneath. Posh restaurants put the cheese at the bottom, so the lid effect is a bit lost. Still, here is my recipe, that I have developed. Mix all base ingredients into a dough. The dough can be frozen. Grease a deep baking tin, preferably the non-stick type. Roll out to just under 0.5 cm thickness and place on a non-stick deep baking tin. This is a tricky one, the dough tends to be quite unwilling to stretch, so roll it to be a bit bigger than the baking tin, as it'll shrink when you lift it up. Brush the dough lightly with grape seed oil, then put on your choice of toppings. Cover with aluminium foil. And if you do like cheese, put that on last and skip the foil. Bake at 225 degrees C or gas mark 7. When baking in an electric oven, it's quite OK to use a sheet of greaseproof paper on the baking tin and put the pizza on that, but I've noticed that gas ovens are different and make the dough stick to the paper and it's impossible to get it off, so keep away from the easy paper alternative if you are using a gas oven. Update 27.10.2006: I tried the pizza dough recipe from my bread machine, a Panasonic SD-253, it was very nice too. 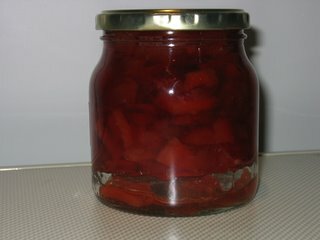 Update 10.02.2007: Today I actually took the time to make a tomato sauce, rather than just use liquidised tomatoes. It is definitely worth doing this, it was a lot tastier. This year, it has been such a strange weather - some people are still picking tomatoes. And it's October and mornings are getting darker. If there is a really hot day with lovely sunny weather, I recommend cooling down with this starter. It's another traditional Bulgarian recipe, a variety of it is known as Greek tzatziki. As usual the quantities are approximate, I've never measured them. Place the yogurt in a deep bowl and add the cucumber. Use scissors to chop the dill into the bowl. Add the oil, chop or press the garlic and add as well. Add some water, salt and walnuts if you want. Stir well. If it seems too thick, add more water. It should have the consistency of a soup. If you have been to Bulgaria on Summer holiday, you have probably had this as a starter. Unfortunately, restaurants are stingy and use mostly water. They also grate the cucumber, which just makes the tarator more watery and tasteless. Diced cucumber gives something crunchy in the soup and keeps it's flavour. If you don't like garlic, reduce the amount or completely skip it. And careful with the walnuts, they might not be to everyone's taste, better place them on the side so that whoever wants them, can just add them later. This is a really good way to rehydrate. And in order to get the flavour out, make this a few hours in advance and keep in the fridge. Alternatively, if you don't have time, add some ice cubes when serving. I tend to live on this and salad in the Summer. If you are going out for a walk, collect colourful leaves. Place them between newspaper sheets and then place the sheets under a thick book and leave for about a week. Get a bunch of old candle stumps (not too strong colours), place in a regular pan and melt on low heat. Remove any bits of the wick. When the candles have melted completely, take out the leaves and dip them in, one at a time, and make sure each gets completely covered, then shake of excess and place on a greaseproof piece of paper. Each dip takes only seconds and it takes about a minute or two for the leaf to dry. This will preserve the leaves and their beautiful Autumn colour and they can be used for decoration around the house. If you have the time, you can make a pretty wreath, or like I did a couple of years ago - just spread them on the mantle piece. It is very important that the leaves are completely dry when you start. If they are "fresh", it's likely they'll go brown or worse - rot underneath the candle wax. 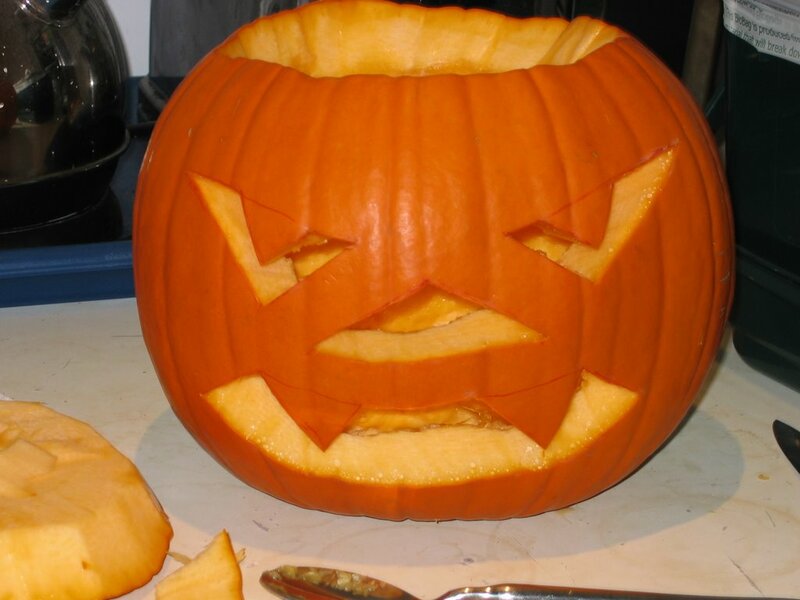 Mainly for Halloween, this is a nice and light dessert. Cut the squash in the middle between the narrow and rounded part. Then cut the rounded part in half and scoop out the seeds, but don't throw them away. Cut up the bits into smaller chunks, then peel them with a vegetable knife as the skin is too tough for potato peelers. 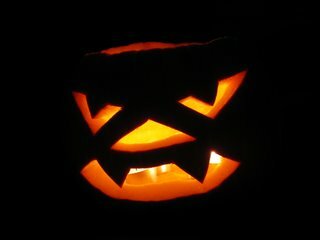 Boil the pumpkin chunks, only put enough water so that only the bottom half of the chunks are under water. Boil until soft. Alternatively the chunks can be steamed, but you'll need to add water for the cream. Blend with the water until smooth. A thick cream like custard should result. Add sugar and cinnamon to taste, then pour into portion sized glasses. Chopped walnuts can also be added. Decorate with creme fraiche/mascarpone or whipped cream and top with chopped walnuts. Cool in the fridge for at least a 3 hours. If you are doing a Halloween dinner party, here's a serving suggestion. 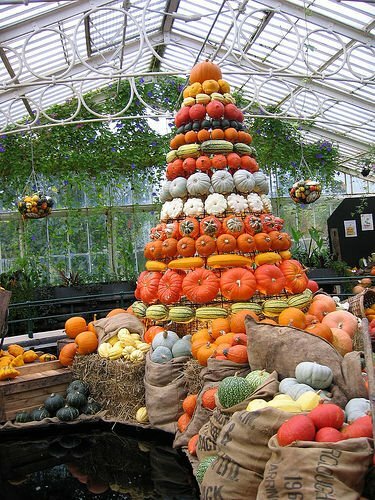 Get mini-pumpkins, one for each guest. Cut off the tops and scoop out both seeds and flesh, then back fill with the pumpkin cream and put the tops back on, slightly on the side. I watched on telly when Rachel Allen did these and scribbled down the ingredients some time ago, in the hopes of trying them out once the cooker was installed. Well, last night I made them, but wasn't too sure of my scribblings, so invented as I went along. Today I found her recipe, she's made some changes to it as well. I used rye flour instead of the wholemeal (coarse brown flour in the TV show). Then I used porridge oats and sunflower seeds, but not linseed (as in the TV show). Also I wasn't sure about the raising agent, so I used 5 tsp of baking powder instead. The buttermilk was swapped for Jersey gold top milk of 5.2% fat (it smelt of butter). I used up all the liquid and the dough was extremely sticky. I spread some seeds on top of it and pressed them in, but they didn't stick, so next time I need to remember to save some liquid for that. Also, 5 tsp baking powder made the dough very salty, so must try using 1 tsp of bicarbonate of soda instead. As for baking, it took longer than she said on telly - some 30 minutes, of which the first 15 were on 230 degrees (gas mark 8), then the last 15 were on 200 degrees (gas mark 5). Lundulph was very surprised, he expected regular scones, to be eaten with clotted cream and jam, but these are more like the American "biscuits" - savoury. Should be good with soup, I think. I just had a small nibble last night, but will try a whole one today. Despite using far too much baking powder, they didn't rise much and are actually quite heavy. So I'll have try with wholemeal or brown flour next time. But the good news is that they can be frozen and are quite tasty afterwards as well. Their heaviness means that they don't soak up liquids very well, so if you like dipping, it's not ideal. Personally I think that only babies and old people who have lost their teeth are OK to dip. I've had my share of bread dipped in tea or soup and I really don't like the soggy texture, which is why don't approve of dipping. As long as I can remember, my Dad has roasted almonds and peanuts in the oven. On very special occasions, he's done walnuts too. He tends to make them salty, I just like them au naturel and they are so very nice when they are hot out of the oven. 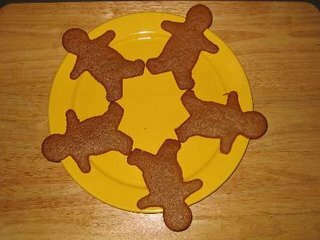 Here's how to make them. Raw nuts of some sort are required, almonds, peanuts, walnuts, whatever. Place in a single layer on a shallow baking tin. Shallow meaning about 1.5 - 2 cm deep. Put under the tap, so the nuts get wet, but don't leave them to soak. Drain as much as possible of the water, then season with salt, stirring to spread it through. Place in a pre-heated oven at 160 - 170 degrees C. Stir every 5 minutes and taste as well. It should take about 15-20 minutes. The trick is to take the tin out before the nuts are ready as they keep their heat well and continue "roasting" afterwards too. If you let them get ready in the oven, they'll go burnt and bitter afterwards. At this point, I start eating them as soon as I can manage to touch them without getting burnt, I like the chewiness they have. But the nuts are quite nice cold as well, so once cooled completely, they can be stored in a plastic box. An idea that just struck me, if you skip the salt at the beginning, but just roast them, then you can make caramel or toffee and quickly stir the nuts in, halfway through roasting, that should be quite nice too.